All organisations aim to make a profit, or to increase their revenues, so they want to invest as little as possible to reap the highest possible benefits. I outlined, in the previous sections, the importance of identifying and classifying benefits in accordance to their significance for the business. This can only happen if there is a sound governance system in place. Governance is one of the most misused terms in business these days. Governance is currently associated with disaster prevention, risk mitigation and consequently, tighter controls. Legal issues and corporate responsibility are the main driver for the systems put in place to support this narrow vision of governance. These systems stifle innovation and create an oppressing culture in organisations where everybody feels that they should protect themselves rather than contribute to value creation. In a well-integrated governance context, programs would sustain a value creation perspective, supported by innovation and empowerment; they would focus on maximising opportunities rather than reducing threats. Program sponsors would also seek a wider set of success criteria; a drive towards sustainability over short-term results and, overall, an increased focus on the link between expected benefits and results. Most current organisational structures and projects are based on tight controls; this approach complicates management system and removes a lot of the innovation and flexibility within the organisation: it favours prevention over empowerment. Putting in place the necessary monitoring and control systems to make the right decisions and realign the program if necessary. This system does not prevent frequent measurement; on the contrary, it encourages regular measurement of results based on the realisation of expected benefits. But measurement is made at significant gateways and based on results rather than on a pre-set schedule and mere respect of the baseline. Programs are in essence complex, according to Henry Mintzberg: in cases of high complexity and slow rate of change, which is typical of large scale governmental or infrastructure programs, decisions are made in cooperation, so as to tap into the collective expertise of the team and to make sure all the available data has been considered. Because the rate of change is not fast, there is time to formulate the decision and traditional decision tools can be used in an analytical approach. When the situation is both complex and fast moving, traditional decision-making cannot be used, a sensemaking approach is the most effective in this case. The team goes through the steps of sensemaking, ideation and elaboration before making a joint decision to proceed to the implementation. This is also the case in Agile management, where decisions are made, often on a daily basis, by the stakeholders most concerned and where reporting and control are kept to what is essential, rather than on what is required by a template system developed independently of the situation. Programs are the link between the business strategy and the projects while Agile methods are the link between the project and the technical and operational aspect of the delivery. The Project Management Institute’s PMBOK Guide® (2008) clearly limits the scope of project management from the issuance of the project charter to the closing of the project, that is, the delivery of results. Beyond the project, both upstream and downstream, there is a need to manage ambiguity. 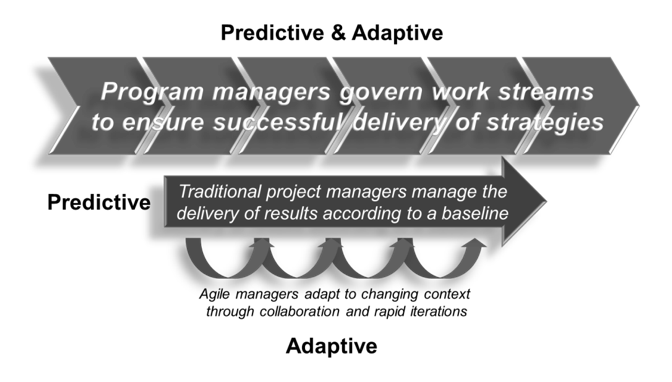 Program management and Agile methods can help achieve this because: projects are predictive, Agile methods are adaptive and program management, which harmonises them, is both predictive and adaptive, as illustrated below. Michel Thiry is managing partner of Valense Organizational Consultants and Adjunct Professor at UTS, Sydney. He has more than 35 years worldwide professional experience and has worked in many cultural environments and is a regular keynote speaker at major international events. His latest book Program Management (2010) has been presented with an Award of Merit by the Canadian Project Management Association. In 2006 he was elected PMI Fellow for his contribution to project management and in 2007 he was nominated Fellow of the Association for Project Management. In 2008, he was awarded a Life Achievement Award by the Canadian Society of Value Analysis. Michel Thiry has written 8 articles for us.